A man accused of murder after stabbing a teenage burglar to death during a break-in at his mother's home has had all charges against him dropped. 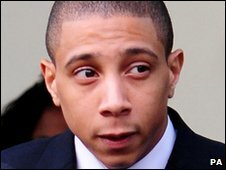 Omari Roberts, 23, confronted burglars Tyler Juett, 17, and a boy of 14 in the property in Nottingham in March 2009. Juett was killed in the altercation. Mr Roberts was formally found not guilty over the death shortly before his trial at Nottingham Crown Court. 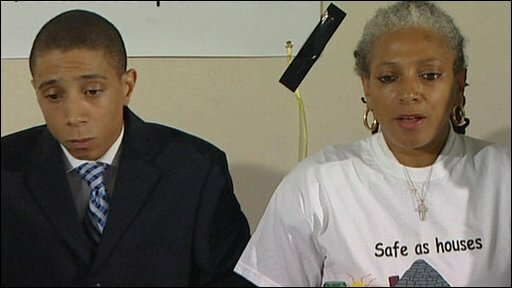 The decision to prosecute was described as "outrageous" by Mr Roberts' mother. 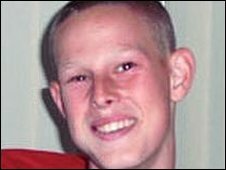 Trainee builder Mr Roberts stabbed the teenager after he discovered him ransacking the house in the Basford area of the city. He was later charged with murder and attacking Juett's 14-year-old accomplice, who cannot be named. The Crown Prosecution Service took the decision to drop the charges against Mr Roberts shortly before the case against him was due to begin at court. Outside court, Mr Roberts said the experience of confronting intruders in his own home had been "horrific". He later told a news conference at the Crowne Plaza hotel in Nottingham: "The past year for me has been a nightmare. It's been very stressful. I haven't wanted the events to happen as they have happened. "I have been taken away from my family. I have had restrictions to what I can do. I am overwhelmed that the charges have been dropped but it still hasn't sunk in yet." The court heard that the decision to drop the charges came after the younger of the two burglars was re-interviewed by detectives two weeks before Easter. The boy, who is now 15, suffered two stab wounds to his right knee during an initial confrontation with Mr Roberts in the kitchen of the semi-detached house. He claimed he then fled the house with Mr Roberts in pursuit. Prosecutors said this gave them a realistic chance of gaining a conviction as it meant Mr Roberts would have had time to call police. But in the interview last month, the boy admitted he waited for his accomplice outside the house. This supported the assertion by Mr Roberts that his struggle with Juett, from Aspley, Nottingham, immediately followed a fight with the boy, Gregory Dickinson QC, prosecuting, said. The teenage accomplice also told a social worker following the burglary that he did have a knife and "would have killed" Mr Roberts, despite telling police he was unarmed. Mrs Justice Dobbs, sitting at Nottingham Crown Court heard Mr Roberts confronted the teenager after he returned home from work for a lunch break last March. He found the patio door of his mother's semi-detached house in Basford smashed in. Mr Roberts then grabbed a kitchen knife from a drawer to protect himself as he was attacked by the 14-year-old. In the struggle the youngster, who cannot be named, was stabbed twice in the knee and was chased off the property by Mr Roberts. Juett, who was upstairs ransacking a bedroom, rushed down stairs to confront Mr Roberts, who in a fight stabbed the teenager in the shoulder, severing a major artery. Defending barrister Jerome Lynch QC told the court: "The basis on which this case is being dropped at the 11th hour is a matter of public interest. It's clear that the prosecution's case has always been predicated on the reliability of this (boy). "In our submission that was never a realistic approach. They relied on what he was saying, the veracity of what he was saying, and in our submission that was a flawed and erroneous approach." Mr Roberts' lawyer Jonathan Eppley said after the case: "Omari was put in a position in which he was fighting for his life. "He had no option but to defend himself - everything happened in a split second, he'd just returned to his mum's house for a little bite to eat and found himself in a terrible position." The Crown Prosecution Service (CPS) said the decision to drop the charges was made after it received "significant new information" after the original decision to prosecute. A CPS spokeswoman said: "After receiving significant new information last month, the case was reviewed and it was decided there was no longer a realistic prospect of conviction." Mr Lynch said the Director of Public Prosecutions (DPP) Keir Starmer should have been involved in the decision over whether to bring the case to court. He said: "In cases of this kind, the DPP should be involved because then we would have someone to point the finger at." Outside court, the barrister added: "Personally, I think he (the DPP) should apologise to this family. It's tragic." The CPS spokeswoman said the DPP had been informed of both the decision in October to charge Mr Roberts and the latest decision to drop the charges. She said Mr Starmer had "no objections" to either decision, but was not involved in making them. She added there would be no apology to Mr Roberts because the CPS had kept the case under review and changed its decision "after new evidence came to light".